Principia has been working on offshore projects for 30 years for mooring design, floaters motion and installation analyses, subsea cable and structure design. Taking advantage of this experience developed for the Oil & Gas industry, PRINCIPIA provides engineering support to the main actors of the marine renewable sector to address this challenging domain at the crossroad of different cultures. Principia develops also commercial software and is adapting its products to the renewable market by proposing specific products for floating wind turbine (DeepLines Wind) and coupling its different software (DIODORE – Hydrodynamic, NSO – structure, EOLE – CFD) to answer the specificities of wind and tidal turbines. The main focus of Principia is the design of marine renewable system from a structural and mechanical point of view by assessing the fully coupled dynamic response of such system under aerodynamic and hydrodynamic loadings. 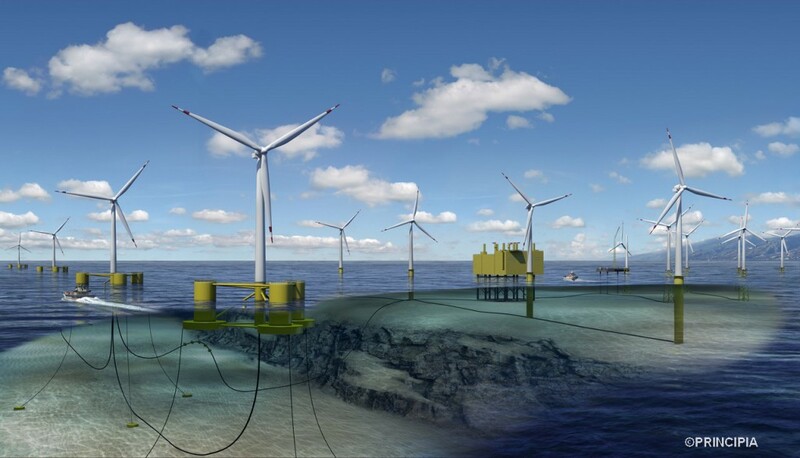 Aware of the engineering practice in offshore for mooring and sea keeping analyses, dynamic power cable design, advanced structural analyses and installation studies, PRINCIPIA has been supporting the success of offshore wind turbine projects since the start of the development of this activity. PRINCIPIA is currently involved in the design of several WT floaters at conceptual, basic or detail design stage. Our integrated tool “DeepLines WIND” initially dedicated to wind turbine may also be used for floating tidal turbines in order to performed coupled analyses. Offshore OTEC systems require large floating units to be moored in deep waters with long water intake risers. PRINCIPIA has a long experience in the design of such systems for the Oil&Gas industry at every stage of a project (conceptual, basic or detail).